Printed swim team mesh gear bags are a must-have. When you’re involved with swimming, there is a lot of competitive swimming gear you need to keep with you at all times. This creates the difficulty of finding the ideal way to store all the competitive swim equipment you will need when you head to the pool. While you can invest in more expensive options, printed swim team mesh gear bags can often do the job. 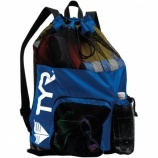 When printed with custom logos for swim teams, these bags are perfect for swimmers on all levels. The first time you got involved in swimming, you were probably overwhelmed by the amount of competitive swimming gear you required. Not only did you need a good quality swimsuit, but you also must purchase swim goggles, a swim cap, a soft towel and other swim training gear. Carrying all of this without a great bag with plenty of room can be practically impossible. When you choose printed swim team mesh gear bags, you will find they offer plenty of room despite their small size, allowing you to easily transport anything you need. With the over-the-shoulder straps, you can carry everything with ease. In addition to being a quality bag you can rely on to last for years, purchasing a mesh swim bag with custom logos for swim teams shows your team spirit and can help you find yours among all of the others at the pool. The mesh bags are available in a number of colors to match your team colors and can be screen printed with your team’s logo. In addition to the logo, the right provider can also print your name on the bag so you can tell yours apart from your teammates’ bags. Swimming on a team can be a great way to learn how to work together and make some new friends with similar interests. However, when you join a swim team, you will find there is a lot of competitive swim equipment you will need to take with you to the pool, both for practices and for meets. With the right printed swim team mesh gear bags, you will have all the room you need to carry everything you could ever need. If you’re looking for quality mesh bags printed with your team’s logo, contact us. D & J Sports offers in-house screen printing for fast, easy customization of many of their products. 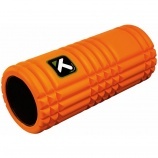 A trigger point grid foam roller can help ease soreness. Competitive swimming requires a lot of hard work and dedication, which can lead to soreness as you move toward a better performance. This means getting the right competitive swimming gear to help you alleviate soreness so you can continue your competitive swimming workouts. You can use a foam roller to ease soreness and help you get back in the water as soon as possible. Many people shy away from using a trigger point grid foam roller because it causes a level of discomfort. However, if you want it to be successful, you’ll need to work at it. It’s typically recommended to start off slowly when you start using a foam roller to ease soreness. For instance, focusing on areas that are particularly sore for 30 seconds is plenty of time. Like every other exercise you may perform, listen to your body. It will tell you when you’ve had enough. A trigger point grid foam roller can be used just about anywhere on your body where you may feel some soreness. Some of the primary areas in which swimmers use this competitive swimming gear can include the glutes, the lower back, the triceps, the shoulder, the hips and more. Wherever swimmers typically feel soreness after working out in the pool can benefit from exercises using a foam roller. In addition to creating the same benefits as getting a massage, the design of this foam roller promotes better blood flow, increasing the oxygen that reaches the area. This promotes healing and can help swimmers feel better. In between competitive swimming workouts, it’s normal to feel some soreness, especially when you’re working hard on specific areas of the body. However, you need to find ways to work through the soreness and improve your performance so you can swim your best at every meet you attend. With the help of a trigger point grid foam roller, you can be ready to hit the water for your next training session. If you’re looking for the best competitive swimming gear to help enhance your performance, contact us. We carry a full line of gear designed to help you train better and improve your overall performance. A swimming snorkel can help you improve your performance. If you want to achieve great things with your competitive swimming, it’s important to use the right competitive swimming gear to train. Those who have reached great heights in their swimming careers, such as Michael Phelps, know the importance of training hard to reach your swimming goals. This is why he’s teamed up with Aqua Sphere to create the Michael Phelps Focus Swim Snorkel. This snorkel offers swimmers the chance to improve their performance in the water. Using the same swim training gear may help you further develop the skills you already have. However, when it comes to succeeding in competitive swimming, you need to find ways to advance beyond that. Phelps recommends using a whole arsenal of training gear, including swimming snorkels, swim fins and more. With his new swim snorkel, swimmers can concentrate on perfecting their strokes before they work on breathing techniques. Swimmers like Phelps understand the importance of working hard to achieve your goals. However, working hard with no rest is counterproductive. It’s important to know when your body has had enough so you can give your muscles plenty of time to recover. Getting enough sleep is also essential to ensure your body functions the way you want when you’re in the pool and out. You may be working hard to tone your body and train it to move through the water as effortlessly as possible. However, it’s also critical to make sure you find ways to stay focused as you train. Training your mind to handle anything your swimming sessions can throw your way. For instance, if something goes wrong, it’s important not to panic. Instead, focus on what you’re doing and how to get through the race without further instance. When you’re training to become a competitive swimmer, it’s necessary to work hard to achieve those goals. There are many competitive swimming professionals, such as Michael Phelps, who have been able to reach great heights with their swimming achievements. With these tips, along with the new Michael Phelps Focus Swim Snorkel, you will be able to strengthen your swimming techniques and improving your performance. The more you train, the better swimmer you will become. If you’re looking for the best selection of swim training gear, including a swimming snorkel, contact us. We provide a vast array of training gear to help you swim your best. The new Speedo Nemesis fins were created to help swimmers develop their skills. Technology is constantly changing, even in the world of competitive swimming gear. Swim fins have been used for many years, providing swimmers with the resistance they need to strengthen their kick and achieve the desired technique. The new design of the Speedo Nemesis fins is designed to work like the pectoral fins of the Humpback Whale, using a natural approach to swim training. The features on the latest swimming fins for training are conducive to athletic success. The scalloped outer edge is designed to increase the surface area of your foot against the water. The more surface area, the greater the resistance, which can increase your propulsion and improve your leg muscles. You will move more water and hone your kicking techniques to become a more effective swimmer. Another great feature of these swimming fins for training is the blow valves. These “valves” are actually square holes placed in the medial edge of the fins. The holes are larger on the bottom and smaller on the top to create the proper flow of water to create the resistance you need. This feature also pulls the feet medially so they are in the right position for the most effective swimming technique. The top and bottom of this competitive swimming gear is also equipped with flow channels to help guide the water. Even though resistance is the primary function of these swimming fins, it’s important for the water to flow over them as well. Although these swimming fins for training were designed to provide the resistance you need to move effectively through the water, they were also created with comfort in mind. The fins themselves are created from injection molded EVA foam and are naturally buoyant, helping the swimmer focus on technique rather than staying afloat. They are also ergonomically designed to cradle your foot so you can comfortably wear them for longer. The latest in competitive swimming gear is the Speedo Nemesis fins. These new swimming fins for training were created to help you become a more effective swimmer. While you still need to work hard to become a faster swimmer, training tools like these make the work more enjoyable and efficient. 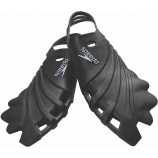 If you are interested in buying a new pair of Speedo Nemesis fins, contact us. We have these swimming fins for training, as well as other competitive swimming gear, in stock and ready to sell. 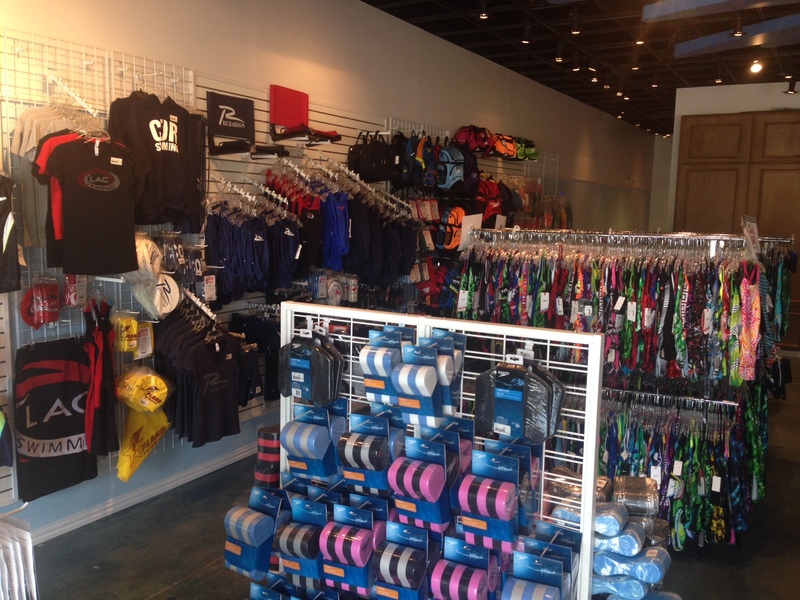 Our new Plano location offers a variety of competitive swimwear and training gear. 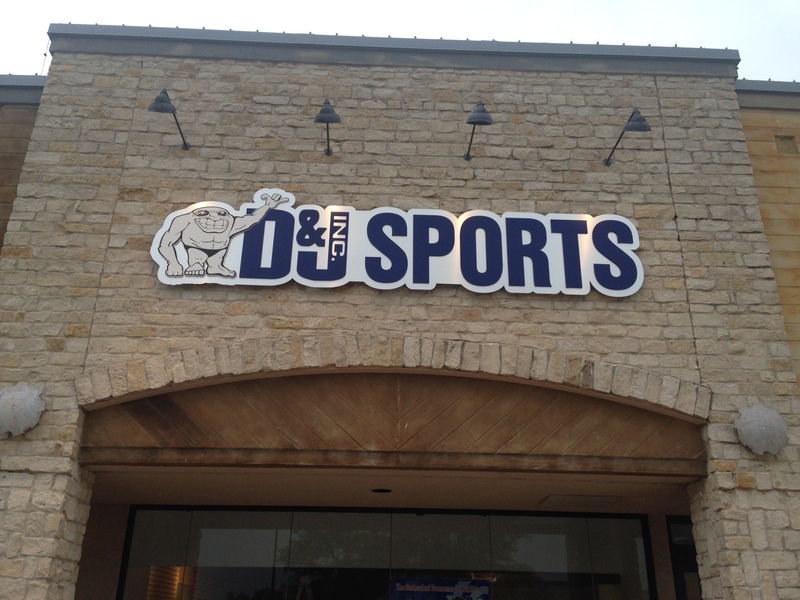 D&J Sports currently offers seven Texas retail locations, as well as one in Oklahoma City and two in Pennsylvania. In addition to our online presence, these retail locations allow us to cater to a local audience, giving swimmers of all skill levels access to the competitive swimming gear and swimwear they need to be more effective in the water. To better serve our local customers, we have recently moved from our former North Dallas location on Preston Road to a new location on the corner of Preston Road and Spring Creek. Choose the best competitive swimwear brands. D&J Sports takes great pride in offering our customers just what they need to perform better in the water. We carry the biggest competitive swimwear brands so our customers can purchase the ideal swimwear for training, competitions and recreational purposes, including Dolfin, TYR, Speedo, Aquasphere, Arena and Nike. In addition to the best swimwear on the market, we also carry competitive swimming gear for those who are looking for top-of-the-line swim training gear, swim caps, goggles, aquatic fitness gear and more. Our new store features a vast selection of the same products you can find on our website. However, you can try everything out before you buy it instead of buying it online. 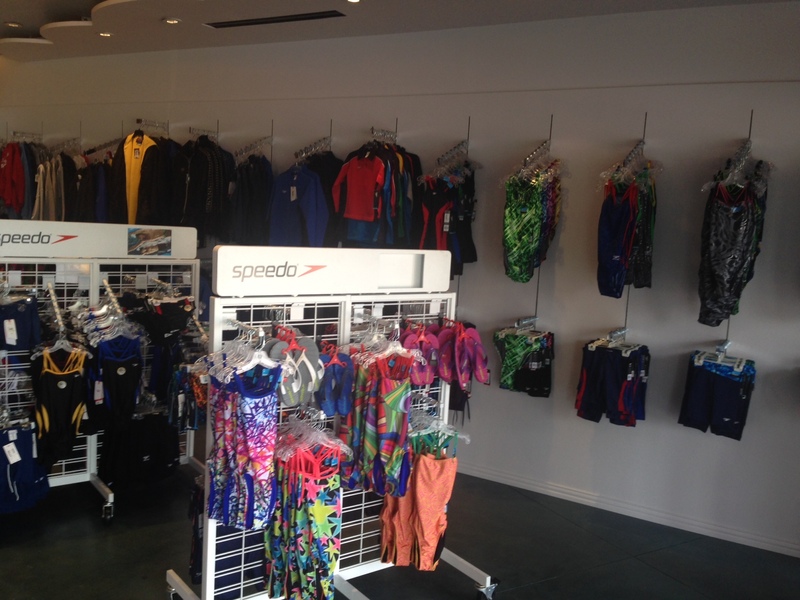 The new D&J Sports location in Plano carries a vast selection of swim training gear. When you need the right competitive swimming gear and competitive swimwear brands, you shouldn’t rely on a major department store that carries a little bit of everything. You will get the best service and find the greatest selection when you choose the specialists. When Plano, Richardson, Frisco and North Dallas residents turn to our new location, they will find a knowledgeable staff who can help them choose the products they need to become better swimmers. Competitive swimming requires a lot of hard work and training with the right swimwear and swim training gear. For this reason, you need to turn to those who understand swimming and everything it entails. At the new Plano location for D&J Sports, you will find all the products you need to train hard and improve your performance in the water. If you are looking for the highest quality in swim training gear and swimwear, contact us. We are ready to give you the tools you need, whether you visit our new Plano location or browse our online selection. The Speedo Nemesis fins are the latest in competitive swimming gear. The right competitive swimming gear can help you train your body to swim as efficiently as possible. While there are a variety of swim fins available on the market, none of them stand up to the latest Speedo Nemesis fins. These will quickly become the best swim fins for training because they provide the resistance you need to strengthen leg muscles and work on your technique so you can swim more effectively. Even though the Speedo Nemesis fins look unusual, they offer one of the most comfortable fits on the market. For many swimmers, competitive swimming gear becomes a critical element in their daily practice routine. If these products don’t fit well and leave marks or cause discomfort, swimmers are less likely to wear them as often as needed. This won’t provide the results swimmers are looking for. The ergonomic foot pocket keeps you comfortable throughout your training session. The overall design of the Speedo Nemesis fins is what makes them the best swim fins for training. Designed to replicate the pectoral fin of the Humpback Whale, the latest in competitive swimming gear helps swimmers learn how to more effectively move their legs to move through the water at a faster pace. These fins were awarded the “Gear of the Show” award from Summer Outdoor Retailer 2014. The scalloped edges are designed to increase surface area to enhance propulsion. The square holes cut in the fins are larger on the bottom and smaller on the top to create a valve effect. The reason is to increase the resistance you experience as you kick and force your feet to turn medially to ensure proper positioning. When it comes to buying the right competitive swimming gear, training tools are one of the best investments you can make. Using the best swim fins for training will strengthen your leg muscles and help you build a more effective kicking motion while swimming. The new Speedo Nemesis fins are designed to work just like the fins found on the Humpback Whale, giving you a more natural motion so you can make the most of your training time and improve your swimming technique. If you are ready to invest in the newest swim training fins on the market, contact us. We offer a vast selection of swim training gear to best meet your needs. A quality swimming snorkel can help you train better and become a stronger swimmer. It may seem unusual that a competitive swimmer would use a swimming snorkel. After all, when you see the competitions on television, you don’t see them using a swimmer’s snorkel. However, they do exist and they can help swimmers to breathe without having to lift their head out of the water. In most cases, these snorkels are used during the training process so the swimmer can concentrate on swimming techniques rather than breathing techniques. The new ylon-a aXis Elite Snorkel can offer swimmers many advantages. Perhaps one of the greatest advantages of this swimming snorkel is the cost. Unlike the Finis snorkel, which has been the market leader in swimmer’s snorkels, the ylon-a aXis Elite Snorkel is less expensive, while still offering a wide range of advantages. Finding equipment that costs less for the same effectiveness is important. 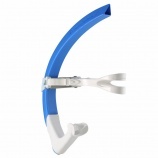 Swimmers will be able to use this freestyle snorkel to help perfect your swimming techniques. The breathing can come later. The ylon-a aXis Elite Snorkel can provide you with all the advantages of a sleek, light-weight design that won’t cause extra drag as you swim through the water. Even if you are only training, you don’t want to compromise your speed. 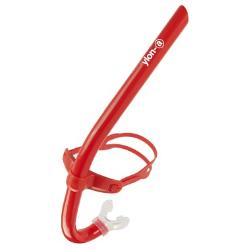 This freestyle snorkel features a simple design with a comfortable head piece that will allow you to use the swimmer’s snorkel for hours of practice without discomfort. In addition, the tube remains stable with his front design so you don’t experience vibrations or other disturbances in the water. The functionality of the ylon-a aXis Elite Snorkel creates a smooth swimming experience for swimmers on all competition levels. If you were to attempt to use a regular snorkel used for snorkeling to swim, the position and shape of the snorkel would slow you down. Not so when you use this specially designed swim snorkel designed for competitive swimmers. You will be able to maintain your natural speed and your flow of motion. In fact, you can even flip under the water to make your turns without complications from the snorkel. If you are looking for the perfect swimmer’s snorkel to help you stay on top of your swimming technique but don’t want to spend the money on a Finis snorkel, the ylon-a aXis Elite Snorkel can provide you with the best fit and function. You don’t have to compromise on your speed or technique to get the swim snorkel that will work best to help you become a better swimmer. Join the university swim teams and club teams that are already taking advantage of this competitive swim snorkel.